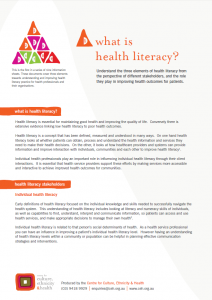 Download What is health literacy? Health literacy is essential for maintaining good health and improving the quality of life. Conversely there is extensive evidence linking low health literacy to poor health outcomes. Health literacy is a concept that has been defined, measured and understood in many ways. On one hand health literacy looks at whether patients can obtain, process and understand the health information and services they need to make their health decisions. On the other, it looks at how healthcare providers and systems can provide information and improve interaction with individuals, communities and each other to improve health literacy(1). Individual health professionals play an important role in influencing individual health literacy through their client interactions. It is essential that health service providers support these efforts by making services more accessible and interactive to achieve improved health outcomes for communities. health services, and make appropriate decisions to manage their own health(2). Individual health literacy is related to that person’s social determinants of health. As a health service professional you can have an influence in improving a patient’s individual health literacy level. 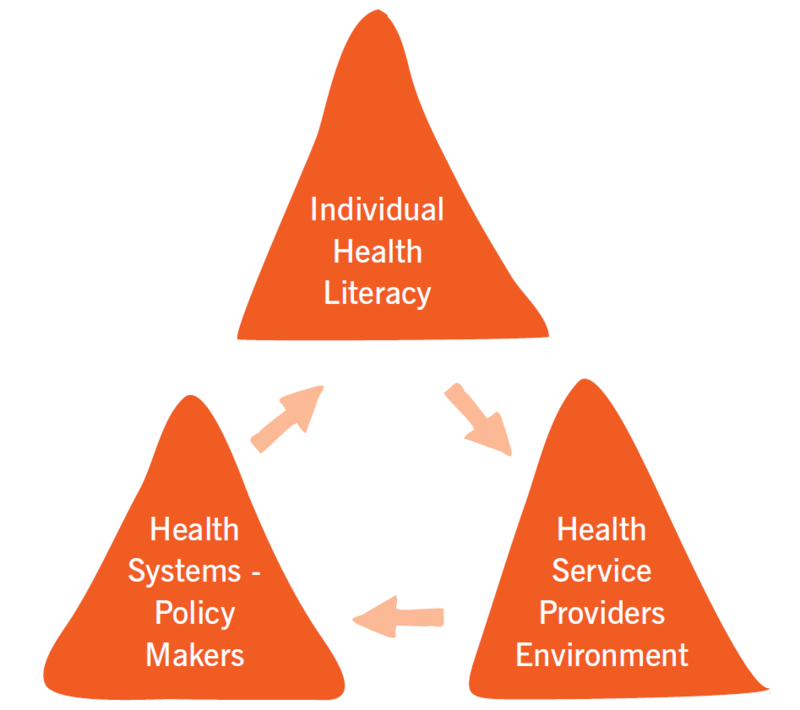 However having an understanding of health literacy levels within a community or population can be helpful in planning effective communication strategies and interventions. Increasingly the concept of health literacy is looked at as an interactive process between individuals, communities, healthcare professionals, organisations and systems. Health providers – both individual professionals and health services as a whole – have a central role to play in this process, as they can influence the health literacy environment within a service setting. Individual health professionals have direct interaction with clients and how they communicate and provide information to those individuals directly can influence their knowledge, interaction and decision making capabilities. prioritising client interactions so they can make sense of, and act upon, the information. This can make the health service easier to navigate and more effective, contributing to better patient outcomes. Some methods of achieving this are included in the Health Literacy Info Sheet series. Health literacy deals with the complexity of both health information that is presented to consumers as well as how well the health system itself can be navigated. Policy makers are key to establishing health literacy within this environment for individual consumers. Increasingly, strategic efforts are being made to improve both the systems environment for health care organisations to enable them to implement health literacy processes and practices, but also of health systems overall at a national level. Accordingly, there has been an increase in key international and national health policies. it relates to other social determinants of health and overall health outcomes. See the ‘Social determinants of health and health literacy’ info sheet. 2. Health Literacy Framework from Parker, R. Measuring Health literacy: what? So what? Now what? In Hernandez L, ed. Measures of health literacy: workshop summary, Roundtable on Health Literacy. Washington, DC, National Academies Press, 2009: 91-98.